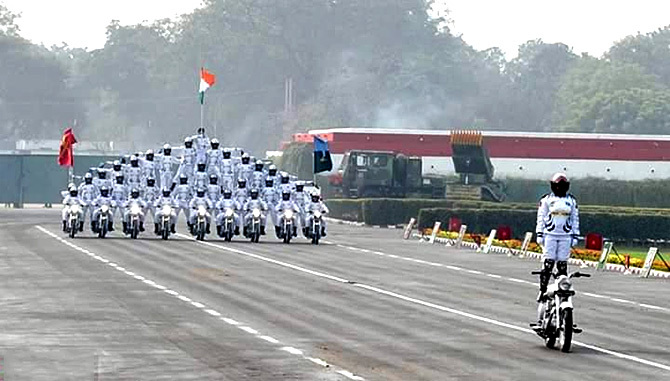 Captain Shikha Surabhi is the first woman to lead a formation of 36 men and 9 Royal Enfields of the Indian Army’s motorcycle display team on Republic Day. She tells Rediff.com‘s Archana Masih how she made space for herself in a team that has never had a woman before. It is after a long time that Captain Shikha Surabhi is getting two consecutive free days, and she is on her way to the railway station in New Delhi to pick up her father, an LIC agent in Bihar. Her family is arriving to see her on Rajpath on the nation’s grand day when she will lead a formation of 36 men and 9 Royal Enfields of the Indian Army’s motorcycle display team on Republic Day. 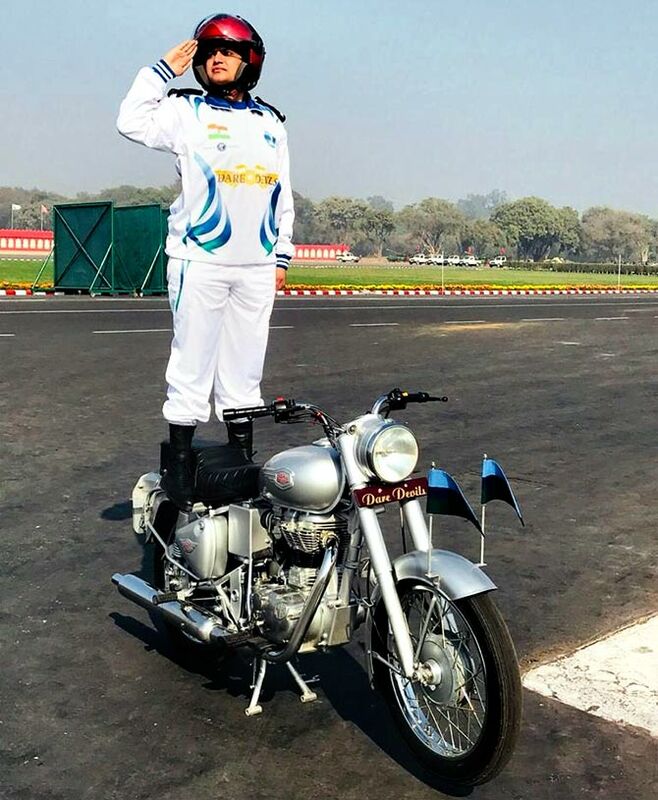 She will stand on top of the bike for a distance of 2.4 kilometers to salute the President of India, the supreme comander of India’s armed forces. The bike will only be maouevered by her legs and will move at 22 to 23 km per hour. The team called ‘Daredevils’ consists of 136 jawans, two male officers and 34 motorcycles. She is the first lady officer to be part of the team. Born in Arrah, Bihar and raised in Hazaribagh, Jharkhand, Captain Shikha learnt to ride a bike around her home as a girl and picked up serious biking after her first posting in Arunachal Pradesh. She did a bike trip from Shimla to Ladakh over 8 days last year. “It brought strength to my arms and taught me how to handle rain, mud and difficult situations,” says the officer from the Corps of Signals who was encouraged by her commanding officer to be part of the Daredevils team. Posted in Bathinda, Punjab, she volunteered to be part of the Daredevils team three months ago. Selected after a month’s training in Jabalpur, Madhya Pradesh, the team has been undergoing rigorous practice for three months. IMAGE: Leading a human pyramid formation that will be at the parade on Republic Day. Two male officers are leading other formations. “My team members were initially worried about how they would teach me. They weren’t sure if I would be strong enough, but they now tell me I have learnt fast, perhaps faster than them,” says the officer who will soon complete four years of service in the army. “I have had some injuries, but thankfully nothing major,” she says over the phone from New Delhi. The team arrived in Delhi on December 18 and has been practicing every day, rising at 3.30 am. Not really nervous about the big day, her only concern is the chance of rain. Heavy rain can make the bike unsteady. Captain Shikha’s main motivation to pursue sport and a career in the army was her mother, who is a sports teacher at a school in Ranchi. “I am from a Hindi medium school and because of sports, I participated in three National Games,” she says. Hand wrestling and kick boxing were her events. She was even part of the army’s mountaineering team that trekked to the Gangotri glacier in Uttarakhand. “I wanted a job with some physical activity,” says Captain Shikha who earlier wanted to be an IPS officer but seriously considered the army as a profession while studying computer science in college. Her younger sister, who is in Class 12, wants to follow her in the armed forces while her brother is in Mumbai trying to pursue an acting career. Such was the officer’s commitment to the Daredevils display on Republic Day that she and her fiancé, also a captain in the army, postponed their wedding from December to May. Fiancé Captain Ankit Kumar will be there to watch the parade with his parents and has been her biggest pillar of support as far as biking is concerned. He is immensely proud that she has worked hard and made space for herself in a team that up till now only comprised men. As Captain Shikha Surabhi’s big day dawns, she is overwhelmed with the opportunity and the privilege given to her. Women officers came from different parts of this vast country to give us some of the proudest moments at this Republic Day. 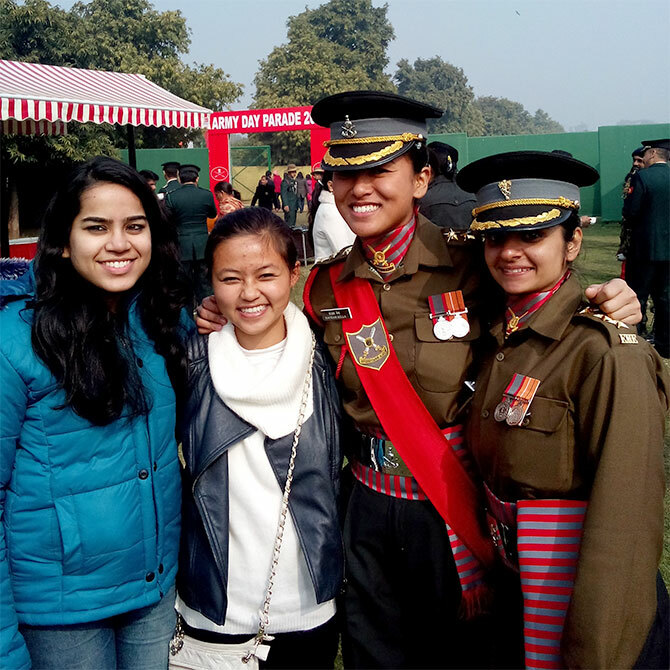 Archana Masih/Rediff.com speaks to Lieutenant Haobam Bella Devi and Captain Divya Ajith, young Army officers who stole the show on Rajpath. Under a rainy sky, just as the grand celebration of Republic Day began on Rajpath, Lieutenant Haobam Bella Devi, a 24-year-old Indian Army officer from Manipur stood near the saluting dais. Like most Indians, she had never unfurled the Indian flag before — and here she was entrusted with that responsibility in front of the whole nation on the nation’s grandest day. Image: Lieutenant Haobam Bella Devi unfurls the flag on Republic Day. In the run-up to Republic Day, she and another officer had practiced the procedure. When the big moment arrived, the only thing she had ears for was the command from the commanding officer of the President’s Bodyguard. Just as he finished giving the crisp command, Lieutenant Bella, tugged at the rope to unfurl the flag and gave it a smart salute. The rose petals wrapped within the flag lay around, while in the distance she could hear the roar of the 21-gun salute. “There is a whole procedure and ceremony as far as the flag is concerned. How it is put up, how it is tied, how it goes up, how it is folded. I learnt everything about it,” says the officer, who was commissioned a year-and-a-half ago and is currently posted in Amritsar. The only child of retired army officer Colonel H G Singh, the lieutenant grew up in cantonments around the country, staying in Manipur when her father was away on field postings. “There are not many lady officers from the North-East and girls get motivated when they see me. I tell them the Army is not a profession, but a way of life,” says the lieutenant who arrived in Delhi on January 4 for Republic Day preparations. The Army’s marching contingent was invited for tea by the Army Chief, General Dalbir Singh, on Republic Day, while there is a ‘Bada Khana’ — a meal shared by the officers and men — on January 31. 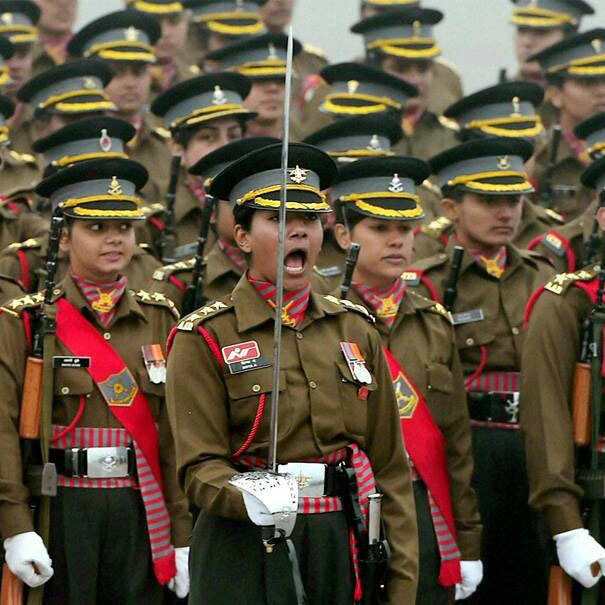 Image: Lieutenant Bella, an officer from Manipur, seen here second from left, is a second generation Army officer. At the tea he hosted, the Army Chief, General Dalbir Singh, not only congratulated his officers, but also gave out commendations. One of them to receive the honour was Captain Divya Ajith, 25, the officer who led the Indian Army’s contingent of women officers. An instructor at the Officers Training Academy in Chennai, she was awarded the sword of honour as the best cadet when she graduated from the academy in 2010. The others who received the Chief’s commendation were the contingent’s drill instructors. Not new to the Republic Day parade, the captain had previously represented the National Cadet Corps as a school girl at the event. Her mother, a housewife, had watched her at that parade and had hoped that one day her daughter would march down Rajpath as an officer. When the captain commanded the contingent to a rousing reception from the audience, her mother was there once again. Her dream had finally come true. Image: Captain Divya Ajith from Chennai received the Army Chief’s commendation for commanding the parade. Photograph: PTI. The marching contingent comprised officers from Jammu and Kashmir to Tamil Nadu. Training began in Chennai in early December where they would march 7 to 8 kilometers every day. Early in the mornings, practice was held at the city’s main highway where 12 files could be accommodated and which provided a longer stretch. Later in the day, marching practice took place at the drill square at the OTA. “Selection as contingent commander was purely on how you fared at drill. The drill instructor, adjutant selected around 10 people, which was later reduced to 3 with reserves,” says Captain Divya, the first person in her family to join the Army. Since the Republic Day parade, she has been inundated with congratulatory messages. Some of the best messages have come from her teachers at Chennai’s Good Shepherd School. Now that she has a home posting, she hopes to pay them a visit soon. In the four years that she has been in the Army, the captain has served in Anantnag, J&K, and MHOW before being posted to Chennai six months ago. “Anantnag was a very good exposure for me. It was a field posting. I had counter intelligence duties there,” says the officer whose father is a painting contractor.